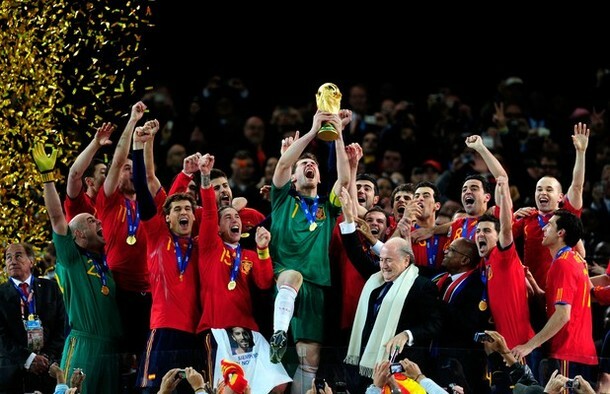 Iker Casillas of Spain celebrates lifting the World Cup with team mates. Vicente del Bosque hailed his side's first World Cup success as "a reward for beautiful football" as Spain withstood Holland's strong-arm tactics to claim the trophy at their 13th attempt deep into extra time. The Spanish emerged from a fractious contest, in which the referee, Howard Webb, awarded a record 14 yellow cards including two to Holland's Johnny Heitinga, to prevail courtesy of the substitute Cesc Fábregas's clever pass and Andrés Iniesta's well‑taken winner. If there was disappointment that what had appeared to be a mouth-watering final had degenerated into a scrap, then Del Bosque found solace in his side's success. "I'm here to speak about the beautiful things in football," said the Spain coach. "It was a very intense game, balanced and even. It was rough at times but that's part of football. They made it very difficult for us to play comfortably. There was pressing from both sides but football is moving forward. The reward today was for beautiful football. "I tried to ring home in the dressing room after the game but everyone was ecstatic and it was difficult to speak, it was so loud. But Spain, as a country, deserves this triumph. This goes beyond sport. Everyone was behind us back home and we're delighted to reward them all with this victory." Iniesta's post-match assessment had been interrupted when Carles Puyol, Gerard Piqué and Fábregas burst into the media theatre chanting in celebration. The Barcelona midfielder was one of those booked here after removing his shirt after his goal to reveal a message to Dani Jarque, the Espanyol captain who died of a heart attack last year following a training session. "We wanted to pay tribute to him and this was the best opportunity to do so. I really can't believe it yet. It hasn't sunk in. I've made a small contribution in a very tough game, a very rough game – there were all sorts of things happening out on the pitch – but Spain deserved to win this World Cup. It's something we should all feel very proud about. Incredible." This side have now lost only twice since beating England at Old Trafford in February 2007 – to the USA and Switzerland, both in South Africa – and have added the world crown to that of the European title, claimed two years ago in Vienna. "We have excellent players, players of wonderful quality and huge talent, and this is a fitting reward," said Del Bosque. "They show that every time they go out on the pitch. This is a continuation of what we achieved [under Luis Aragonés] two years ago. All these players deserve the prize and the reward they've earned today."